Developer Studio automates the process of moving the files to the target servers. In addition to deploying files as described in this topic, you can deploy them in the Scenario Editor. See Step 3: Partition the Project Files. The buttons on the toolbar in the Scenario Editor are also available in the Explorer. Select the project. From the drop-down list on the toolbar, select the deployment scenario. Deploy to move the files to the servers based on the partitioning defined in the deployment scenario. Deploy and Run to move the files to the servers and then run the starting object defined in the deployment scenario. The Run option on the shortcut menu runs the starting object defined in the deployment scenario. During deployment, a dialog box tracks the status. You can click Cancel to terminate the process. The following image shows the Deployment Progress window detailing successful deployment of HTML files to the web server and procedures to the WebFOCUS Reporting Server. Tip: You can click the Details button if you do not want to view messages during the deployment process. Deployment Status: Succeeded, 0 warning(s), 0 error message(s). Deployment Status: Cancelled by user. During the deployment process, the File field shows the names of objects as they are deployed to a server. The progress bar indicates how much of the process is complete, as it takes place. The Status field displays the events that took place in the deployment process. The following image shows the Scenario Editor. Displays the files in the selected project and their properties. The value of Assigned is No if the file was not assigned to a server for deployment. Assigned is Yes if you assigned the file to a server for deployment. 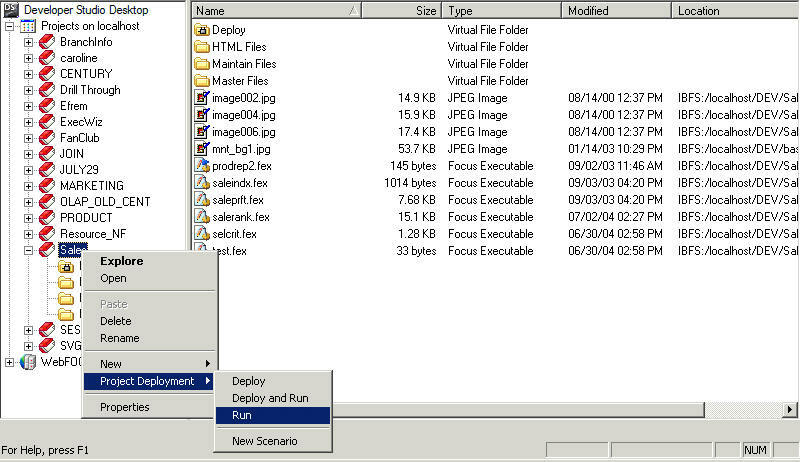 Displays the WebFOCUS environments to which you can deploy files. The following image shows the Deploying Application dialog box. Tip: You can click the Cancel button during the deployment process. When deployment ends, the Cancel button becomes a Close button. 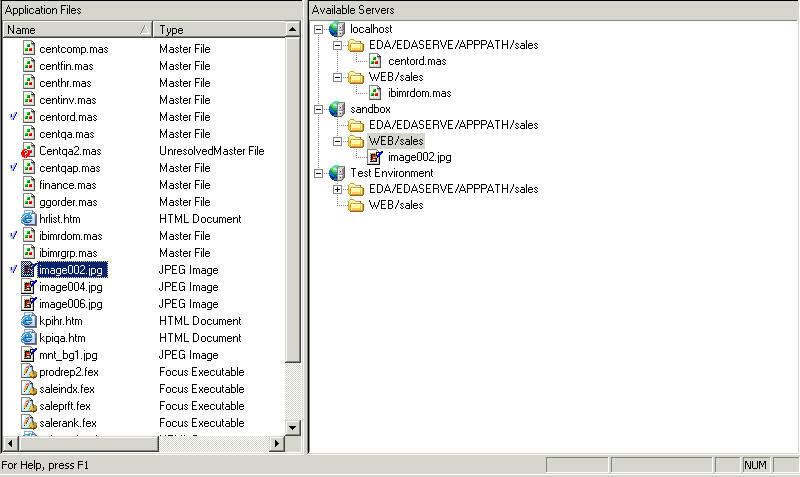 During the deployment process, the File field shows the names of objects as they are deployed to the server.